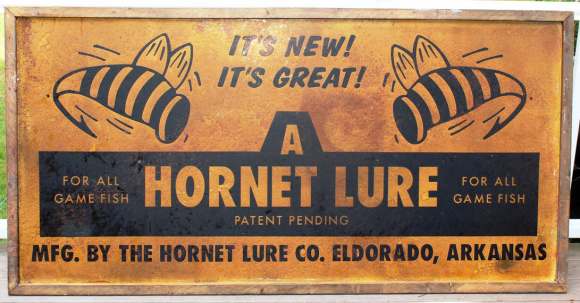 This is a rectangular Hornet Lure porcelain sign. This particular Hornet Lure sign is predominantly yellow with black text. It reads, “It’s New! It’s Great! A Hornet Lure For All Game Fish, Patent Pending, Mfg. By The Hornet Lure Co., Eldorado, Arkansas” and features two hornets with fishing lure stingers.